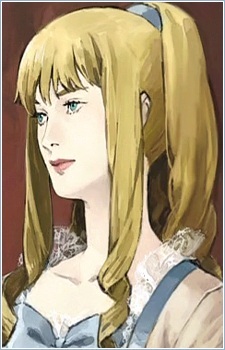 Lia is D'Eon's older sister, and a skilled fencer. She was killed under mysterious circumstances and the story revolves around finding the truth. Despite flashbacks of her being a caring and considerate young woman, her spirit is full of great anger, sorrow, and the desire to exact revenge. She had a unique sword stance, which made it easy for Teillagory to identify her when the others are unsure. Later in the series, it becomes more obvious that Lia was connected to Maximilien Robespierre and some of the other supporting characters in the series. Many royals remember and looked up to Lia, such as Empress Elizaveta of Russia.